We rented the Oliver's Twist series on DVD and we loved it. Jaime Oliver cooks a bunch of simple and interesting recipes with other great chefs in his fun light hearted style. It's the kind of food you want to cook at home. That's just what we decided to do. 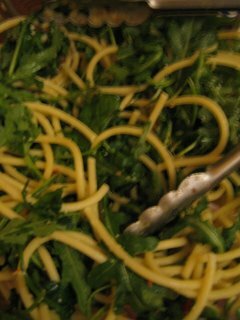 We made a great dish we saw on the show that made for a decadent starter for Desi's favorite lemon arugala pasta recipe. 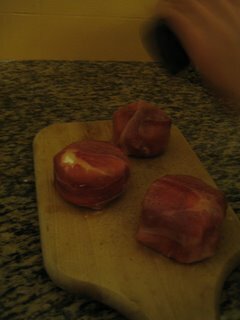 First we wrap goat cheese in prosciutto on one of our wooden cutting boards and add some black pepper. 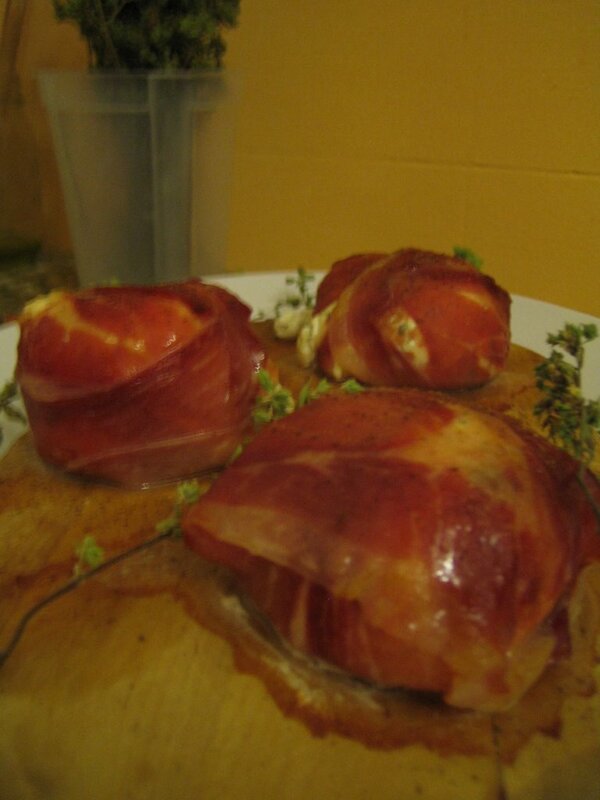 Then we bake it on the cutting board, just like Jaime does on the show, and serve it warm, cheese oozing out. The prosciutto wrapped baked goat cheese was the perfect precursor for Desiree's signature dish, lemon arugala bucatini. This dish may also have originated from one of Jaime Oliver's Naked Chef shows, we can't remember. But it is definitely Jaime Oliveresque in it's simplicity, focus on fresh ingredients and because it uses lemon zest, one of Jaime's favorite ingredients. We learned a few lemon tricks on the Oliver Twist series. Boil bucatini pasta in salted water. Once the garlic begins to cook and the aromas rise from the pan, add plenty of lemon zest, and then toss in a couple of handfuls of arugala. 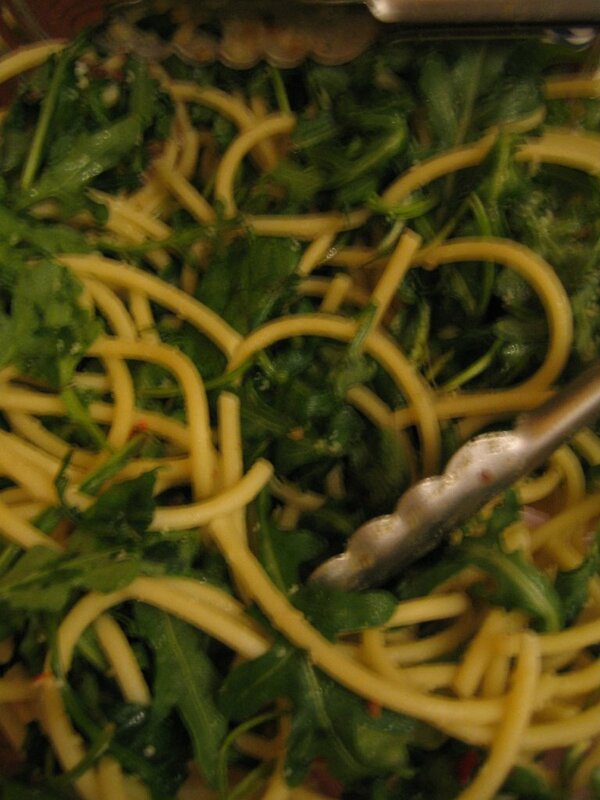 Immediately add the al dente Bucatini pasta with a little bit of the water from the pot and some fresh lemon juice. Toss in pan for a minute over medium flame and finish with sea salt, black pepper, and grated parmesan cheese. We also like to add red chile flakes sometimes. This is a nice dish for an early dinner when the sun is still out. Also, a lil bacon never hurt. Prosciutto, pancetta, jamon serrano ....... a ham hock.